We hate to sound like broken records, but Image treadmills are (like so many others) manufactured by that old stand-by, ICON Fitness. The Image line covers a wide range of prices for almost any budget, which is unusual coming from ICON. Most of their other brands fit very particular niches and price points. 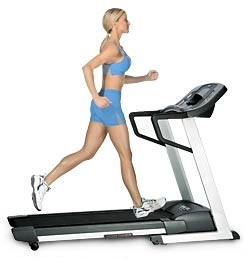 You can get Image brand treadmills for anywhere from $400 to $2,000, which is an impressive price swing. Interestingly, the higher you get on price point, the less we like the Image brand. Part of this is because the warranty doesn’t improve with any price increases. No matter which model you get, Image treadmills have a 90 day warranty, which is not what you should get on any machine over $1,000. The higher priced ones also lose out to other brands in the same price range when it comes to comfort and features. 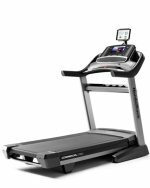 If you’re looking for a decent treadmill to use at home so that you can keep walking in bad weather, however, consider a budget model. Lower end Image models aren’t a bad deal. Sure, you’ll still have repair issues (for $400-$500 repairs are a given), but you’ll get decent performance and a stronger than usual motor for the price. Image machines also come standard with wider belts, making your treadmill workout more comfortable and less prone to possible injury. The lower-end Image models also have features you don’t usually find on budget treadmills, such as pulse grip heart monitors and iFit compatibility. You’ll have a tough time finding these features for under a grand from most other companies. Whatever the reason, the Image treadmills that are under $1,000 are decent little machines for the individual looking for a light workout. Image 16.0Q - Budget model for beginners.